From October 9th to 12th, 2011 will take place in Todi (PG) the XLVIII (48th) edition of the Convegno storico internazionale (International historic Conference) promoted by the Centro Italiano di Studi sul Basso Medioevo - Accademia Tudertina (Italian Center of Studies on the Middle Ages - Tudertina Academy). 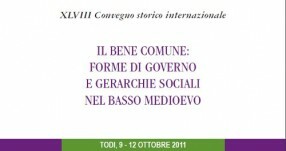 The beginning of the 2011 will be: "Il bene comune: forme di governo e gerarchie sociali nel basso medioevo" ("The common good: forms of government and social hierarchies in the Middle Ages"). Will be discussed the political and cultural structures in Italy between the end of the thirteenth century and the beginning of the fourteenth, will be analized the relations between ethics and politics and the real capacity of governance of the medieval cities. The conference will begin on Sunday October 9th at 10:00 from Palazzo Ciuffelli in Todi with the opening ceremony, followed by the first report, by Ovidio Capitani of the University of Bologna entitled "Ideology of the common good and towns in the disputed assessments of Dante". Will be 19 speakers, and not only Italians, some from Germany, France and England. Participation is open for everyone. Registration fee: € 5.00, which will ensure during the conference a 25% discount off the cover price of the publications of the C.I.S.A.M. Foundation.